Fable is a "Farm to Table" restaurant that strives in using quality ingredients in all of their dishes. They have really gone the extra mile to create a fun cozy restaurant with the brick walls and a chandelier made using hay rakes. But my favourite aspect of the restaurant is the open kitchen! If you sit at the bar, you are practically face to face with the chefs as they cook and plate the dishes. We decided to sit in the dining room because if we were had to sit at the bar, we would be hit with a chilly blast of air each time the front door is opened. I definitely do suggest the bar in the summer! I got the Brunch Sandwich. Between two slices of crusty buttered bread was creamey scrambled eggs, house made sausage, cheddar, tomato jam, arugula and their house made black pepper jam. It came with a side salad and rosti (stringy hash brown that was fried into a little patty of potato yumminess) with a dollap of chive yogurt like YUMMMM! Oh boy was I stuffed and I only managed to get through half of my meal! A hearty comfort meal! 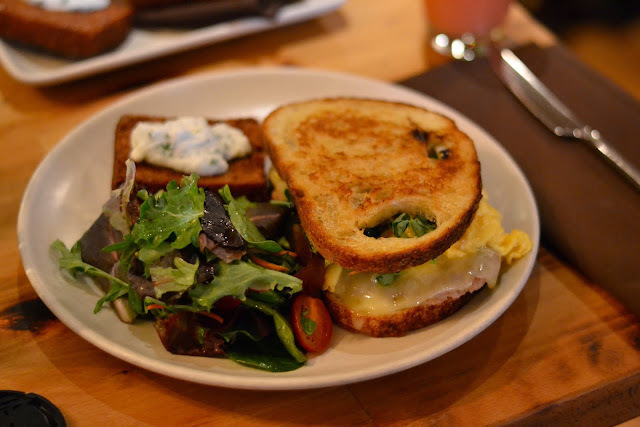 My friend decided to get the scrambled eggs that came with Fable's baked in house Brioche bread and the potato rosti. 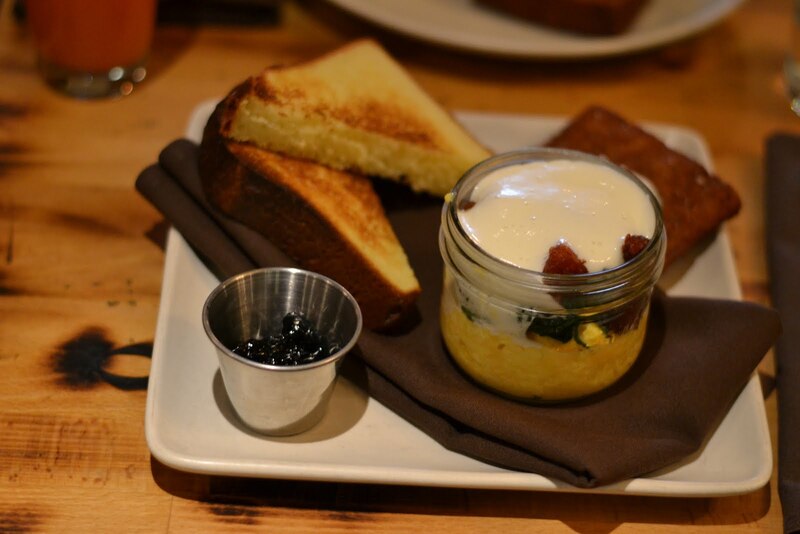 This is probably the first time I have seen scrambled eggs served in a mason jar... good ol Hipster Vancouver haha. It was like a scrambled egg parfait with the different ingredients layered. On the bottom was the creamiest scrambled eggs ever, then sautéed spinach with crumbled crispy bacon. Finally a layer of parmesan foam?!?! Also another first for me! Suggestion - mix all the flavours together to have a delicious scrambled egg! We actually ended up spreading the blueberry preserve on the brioche and then topping it with the mixed scrambled eggs and ate it all together! 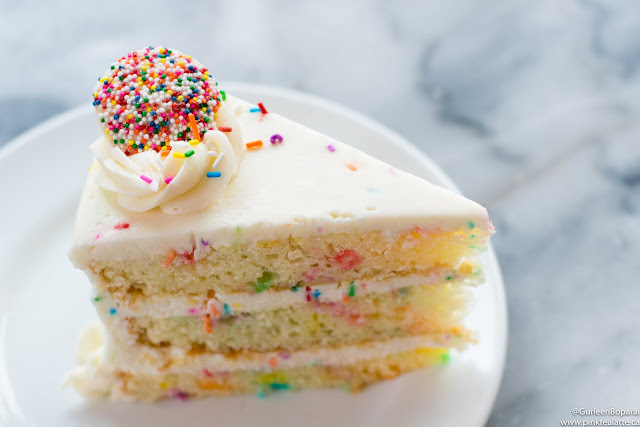 I love mixing sweet and savoury hehe. My only complaint at Fable has to be their unwillingness to make me a strawberry-blackberry smoothie. Fable had a blueberry greek yogurt smoothie on the menu, but I honestly just have never liked blueberries in my smoothies. They definitely had other berries in the kitchen since the fresh berries were being served on top of the brioche french toast and I was also okay if it was a half blueberry and half other berries smoothie. Also, apparently it was the fact they use frozen blueberries in the smoothie and did not want to use fresh berries... I only use fresh berries to make my smoothies at home. It all seemed a little silly and an accommodation they could have easily made. Plus, they were out of ketchup! A fun restaurant in Kitsilano with lots of energy and definitely worth visiting! I hope to try their lunch or dinner in the future! 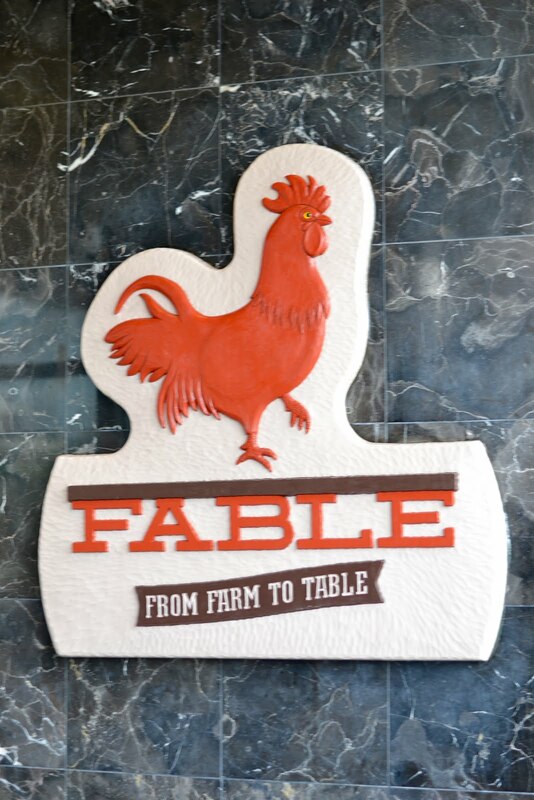 Let me know if you have been to Fable before and how you liked it? 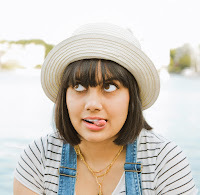 Also, if you have any restaurant suggestions for Brunch, please let me know in the comments below as I always trying new places!